The latest Which? 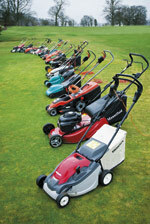 tests have put 18 new petrol, electric and cordless lawnmowers through their paces. We reveal the Best Buys, show the difference between a good or a bad lawnmower and calculate how much energy different mowers use. We’ve tested and reviewed the newest petrol, cordless and electric lawnmowers from top brands such as Bosch, Honda, Mountfield, Husqvarna and McCulloch, plus two push mowers. Unusually, in this round of testing we could only come up with two Best Buy lawnmowers. To find out which models came top in our tests, head straight to our lawn mower review area. There you’ll find the Best Buy mowers from our latest trial, plus 19 Best Buys from previous trials. You can also see which mowers not to buy; in our latest round of testing, four electric lawnmowers had scores in the 43-49% range, just shy of being a Don’t Buy. If you’re looking for a new mower, the models in our review cover different sizes, popular brands and prices, from £60 to £499. We’ve tested powerful petrol models, such as the Mountfield HP46R costing £350, and good-value electric mowers, such as the Honda HRE370 at £149. We’ve also looked at budget mowers including the Flymo Mow n Vac, which costs just £55. We’ve also reviewed nine push mowers from Husqvarna, Gardena and Qualcast, which range in price from £30-£90. Many of the new models have interesting ‘nice to have’ features, such as an ‘easireel’ for storing the cable, or a design aiming to get closer to the edge of the lawn. These could be useful additions, but not at the expense of the basic grass cutting and collecting. How much does it cost to run a mower? We looked at the fuel consumption or electricity each mower used on an average-sized lawn (100 sq m) once a week during spring, summer and autumn. The cheapest electric mower is the low-powered Bosch ASM32 at 65p per year, and the most expensive is the Flymo Glidemaster at £3.30. The Mountfield HP46R petrol mower costs £3.56 per year. The McCulloch M56-875DWA was the most expensive petrol mower to run, at £9.80 a year. So, while running costs are relatively low, there are some differences between mowers, which might be worth considering when choosing your mower.